I’ve been an observer of the sky for about 38 years now, since I was 15 years old. Looking back on those days, compared with today, is astonishing. I used a 7x50 finder scope on my 17.5-inch Dobsonian reflector, and I knew the whole sky, in terms of star-hopping to deep-sky objects. Now computerized databases guide us with telescopes that know where to point. We used to think objects like the Veil Nebula were challenging; now we routinely gaze at distant galaxy clusters and quasars. So much has changed, but one thing has not: Ever since my first days, I’ve found the Observer’s Handbook, an annual publication of the Royal Astronomical Society of Canada, indispensable. Published each year now for more than a century, the book is so chock-full of data for the upcoming year that we routinely use it in the office at Astronomy. It contains monthly summaries of sky events, such as eclipses, occultations, conjunctions, meteor showers, and so on, and vast articles on all sorts of changing solar system phenomena, as well as handy lists such as the closest stars and basic data on planets, moons, eclipses, the Sun, and more. The book’s contributor list is a virtual who’s-who, including many names familiar to Astronomy readers: Jay Anderson, Roy Bishop, Peter Brown, Alan Dyer, Fred Espenak, Daniel W. E. Green, Peter Jedicke, David Levy, Alister Ling, Barry Madore, and others. The handbook’s editor is David Chapman. The book contains 352 pages, is paperbound, and sells for $38.95 for U.S. customers. 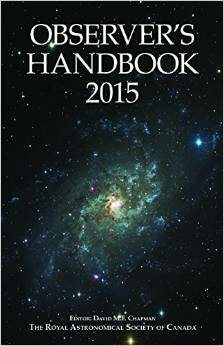 You can order copies of the 2015 Observer’s Handbook here.